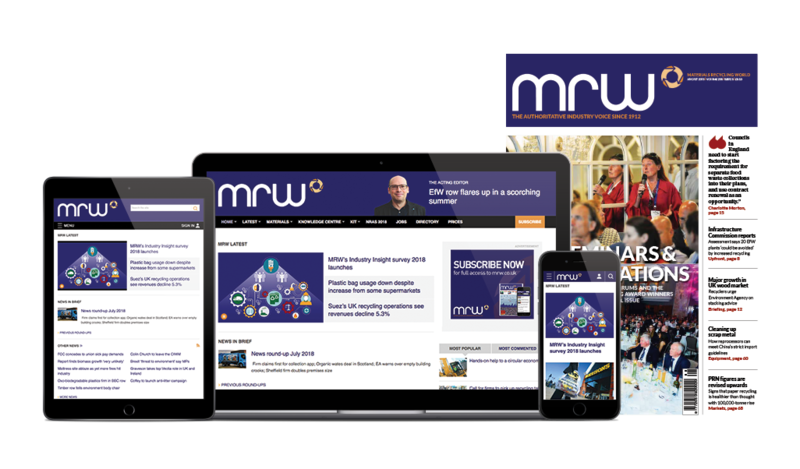 In an exclusive interview, waste minister Lord Taylor tells MRW how the Government is facing up to the challenge of bringing cohesion to the UK’s recycling and waste policy. James Illman reports. Adorning the walls of Lord Taylor’s spacious office in Defra’s Westminster headquarters are pieces of artwork he hand-picked from the Government’s impressive in-house art store, as well as those from his personal collection. He proudly explains that his own pieces, which all share a floral theme and include one which dates back to the 1600s, are a nod to his heritage: the Taylor family flower bulb business. Now run by his son, Taylor & Sons Bulbs has just celebrated its 19th successive gold medal at the Chelsea Flower Show and provided the daffodils which festooned the royal barge during its voyage down the Thames to mark the Queen’s Diamond Jubilee. Few in the waste sector will concern themselves with the minister’s art collection. But they will no doubt be comforted by his desire to apply the lessons he learnt as a successful businessman to his government role. During a wide-ranging exclusive interview with MRW - the first time a waste minster has talked at length about his role - he is quick to praise the industry’s “entrepreneurial” spirit and speak of his desire to boost private enterprise. “It is still a very young industry, even though MRW is 100 years old and, in economic terms, there are still lots of opportunities, especially with the entrepreneurial nature of the people involved and their willingness to take investment decisions. I think that’s very good,” he enthuses. Since his appointment to last September, the jovial former flower bulb magnate has immersed himself in the recycling and waste industry and senior market figures speak highly of him. As the interview progresses, it is easy to see why. Personable, with a self deprecating wit, Taylor is a good communicator and has clearly taken the time to listen to the sector and understand its many idiosyncrasies. But he has taken on a tough brief and, frustrating though it is for the industry, Defra’s waste portfolio is not one of Whitehall’s most glamorous assignments. The department’s already comparatively modest £2.7bn budget will be slashed to £2.4bn by 2015, according to its latest business plan. Very little of this will be available for waste-related programmes, which make up a small part of Defra’s sprawling remit. The department also has to contend with inter-Whitehall sibling rivalry. Communities secretary Eric Pickles has led a concerted effort to make political capital out of the waste agenda, and provoked an often bitter turf war between Defra and the Department for Communities & Local Government (DCLG). The row over weekly refuse collection policy sparked reports - corroborated to MRW by Whitehall sources - of an almighty bust-up between Pickles and environment secretary Caroline Spelman. But Taylor is keen to play down any lingering friction between the two departments, noting diplomatically that Defra has “plenty to do without worrying about weekly collections”. While it would be naïve to accept suggestions of domestic bliss between the two departments, Taylor is certainly right that there is much to do outside the thin sphere of how often the bins are emptied. When unveiling last year’s Government waste review, Spelman admitted that England “lagged behind the rest of Europe” in terms of recycling, and closing this gap represents a considerable challenge. Taylor is quick to defend his boss’s blueprint from criticism levelled by many in the industry, including the Chartered Institution of Wastes Management, which accused the review of lacking “new or radical” ideas or ambitious targets. One of the core planks of the review was to consult on landfill restrictions on wood waste and consider introducing landfill bans on other materials such as metals, textiles and biodegradable waste. Landfill bans split the industry. Some argue they are counterproductive and impossible to police while senior figures, including former environment minister Lord Deben (Lord Taylor’s “waste sector hero”, see box), have called for a full ban on food waste to landfill. John Derek Taylor, 68, was raised to the peerage as Baron Taylor of Holbeach of South Holland in the County of Lincolnshire 2006. Before ascension to the Lords, he attempted to enter the House of Commons by contesting the seat of Chesterfield in the February and October 1974 general elections, but he failed to get elected. He is passionate about a range of environmental issues. As well as his business interest in flower bulbs, which saw him publish Taylor’s Bulb Book in 1994, he has been president of the Lincolnshire Agricultural Society and shadowed Defra between 2006 and 2010. He names former environment secretary Lord Deben (then John Gummer) as his ‘waste sector hero’. “A personal and emblematic figure in environmental issues, who I greatly admire, because much of the framework of environmental activity derives from his vision,” he says. Taylor names anyone who has stripped metal plaques off war memorials as ‘waste sector villains’. But he appears unconvinced that such a move is practical. At the time of this interview, the sector was awaiting the verdict of a judicial review on commingled collections, scheduled to be discussed in the High Court on 13 June. Second-guessing the High Court is beyond any minister. But the overarching issue of material quality is at the forefront of Taylor’s mind as his department finalises the much-vaunted MRF Code of Practice. The code, very likely to be mandatory and consulted on in August, is designed to increase client confidence in the quality of materials leaving MRFs, a key issue since the Government published proposed amendments to the waste regulations that would allow commingled collections to continue in some circumstances. While he stresses that nothing has been finalised, the minister’s emerging thinking offers a good insight into the direction of travel. He stresses that “markets matter” and the Government has no desire to “make the bar so high that the industry feels that it can’t meet” the standards. And, crucially, while standards will become “increasingly demanding” in time, it appears very unlikely that any prescribed level for contamination on materials leaving MRFs will be mandated. This is not the only time he exhibits a natural pragmatism. As we discuss the DCLG’s weekly collection support scheme,Taylor asserts that boosting weekly collections is a “political imperative” which needs to be achieved without damaging recycling rates. Many in the industry argue raising recycling rates rather than attempting not to reduce rates should be the priority, but perhaps this is a battle with Pickles that Defra was never likely to win. Taylor has listened diligently to the industry and is clearly keen to engage with the sector. Providing he sticks around, unlike some of his predecessors at both ministerial and official level, the waste industry may well have a useful ally in the corridors of power. The European Commission has confirmed commingled recycling collections are allowed under the revised Waste Framework Directive (rWFD). Waste leaders insisted a ban on sending food to landfill was a “vital step” as figures revealed around 169 English councils still have no separate food waste collections. The Resource Association has launched a charter to improve public information about end destinations of recovered materials. The maximum fines councils can give residents for leaving waste out wrongly will be cut from £110 to £80 tomorrow. Environment minister Lord Taylor has hosted the first Reuse Forum, which attracted a wide range of companies and organisations across the sector. Lord Taylor of Holbeach is to replace Lord Henley as the recycling minister at Defra.